SEA LA VIE !! EMBRACE LIFE ! Ocean front Villa with SPECTACULAR ! !, CAPTIVATING VIEWS .. UNRIVALED! 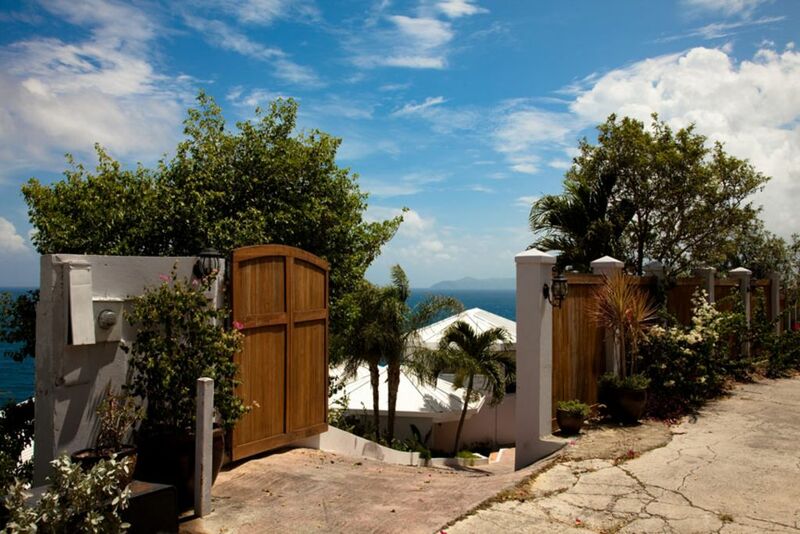 SEA LA VIE affords SPECTACULAR, CAPTIVATING , OCEAN FRONT VIEWS ....UNRIVALED on St Thomas! ...... Imagine spending your days relaxing poolside with panoramic ocean views as far as the eye can see. Listen as the waves crash below, or as the gentle ocean breeze whispers through the palms that align your private Caribbean resort. This is Sea La Vie Villa. Offered for vacation rentals starting in early July 2008, our popular rental home features amazing waterfront views that are unsurpassed on the island. Located in the gated Mahogany Run Golf community, this villa encompasses over 2500 square feet of interior space and 2500 square feet of outdoor living area and beckons those who need a relaxing and private escape. Unlike many other villa rentals, the villa is positioned perfectly on a north side point and surrounded by acres of undeveloped land. You won't have to worry about the neighbor's construction or dogs with this home! As owners and managers of the villa - we know exactly what you need for the perfect vacation. Please read our testimonials from our first year's guests to learn more about our first rate service (and incredible villa!). From the amenities to the personal touches like an escorted ride from the airport, we pride ourselves on making our home, your home. And once you decide to escape to St. Thomas, our website's Guest Reservation Center will allow for secure credit payments (if you choose), along with special activity and dining recommendations, to rental car requests. We make sure you're as comfortable with the process of making the reservation as you will be on your holiday. Please browse our personal website using the links on this page to learn much more about the villa experience, St. Thomas and the US Virgin Islands, and of course - our villa. Find out how Kiwi Cliffs can be your own slice of tropical paradise. You will not be disappointed! Unlike 90% of other rentals - our waterfront villa is located within a gated, upscale neighborhood and is extremely PRIVATE. There are vacant parcels of land to both sides, creating the perfect atmosphere for your island getaway. Off Site Laundry and Dry Cleaning Services available upon request. Please inquire for details and costs. It was awesome will DEFINITELY be there again!!!!!!! This was our first time in the Virgin Islands. We will be back. The property manager met us at the airport and escorted us to the property. Upon arrival, he gave us a tour and answered any questions we had. The house was beautiful and extremely roomy. There is ample outside eating area to enjoy the scenery while dining. The pool was fantastic and provided our own view of a private island. The views were breathtaking. There was a bad storm one evening, but the generator came on and we enjoyed uninterrupted electricity. I would highly recommend a stay. Thank you so much for the positive feedback ! Pleased to know you enjoyed the property and your visit to St Thomas ! Look forward to accommodating your family again in the near future ! Thank you for choosing Sea To Peak Villas ! Needed to travel St. Thomas for a family wedding - traveled with husband and three adult children with significant others - two bedrooms in main house (each with own full bath) and two detached bedrooms (again with full baths) was perfect for our group - house has everything needed (full kitchen/wifi/tvs in all rooms with satellite/8 beach chairs/plenty of beach towels/washer & dryer/gorgeous views/very quiet/blender/toaster/microwave, etc) and Angel was very responsive to any questions/concerns we had both before and during our visit. We are already checking calendar to see when can return! Definitely stop for groceries on way - loved it here!! 1. Privacy - you feel as though you are on your own island! There was absolutely zero noise, other than the birds and the sounds of the ocean waves crashing on the rocks. 2. Bedrooms/full bathrooms - perfect for our group of 4 couples. There are 2 bedrooms in the main house (1 up, 1 down) and 2 additional in the outdoor cabana. Every bedroom has its own en-suite bathroom, which was ideal. The beds were all very comfortable, and 3 of the bedrooms have fantastic ocean views. 3. Outdoor space/pool - incredible! There is a large outdoor dining table (seats 6-8), wrap-around balcony and 2 separate sitting areas on the main level alone! Down a flight of stairs, there is another large space that we were told will be a second outdoor dining area. At the bottom of the next flight of stairs is the huge, beautiful pool with PLENTY of chairs and seating for our group of 8. No matter where you are, there are the most unbelievable views! 4. Main house - very open and airy! The kitchen and dining areas have recently been remodeled and are gorgeous! The kitchen, dining and living room are essentially combined into one large area with tons of space for everyone. We were often together in the mornings and evenings and never felt crowded. The dining table seats 8 comfortably and there is also a breakfast nook for 2. The kitchen is FULLY stocked! We made several meals and had everything we needed. 5. Extras - washer & dryer, large gas grill, coolers (3 in various sizes), tons of bath towels and beach towels, 2 sets of golf clubs, beach chairs (8), snorkel gear (4 sets), hair dryers, 2 separate sound systems/speakers (1 on main floor, 1 by the pool), and playing cards/board games. 6. Property manager - Angel met us at the airport and we followed her to the villa (no way to find it the first time without her!). She even advised us to stop at the grocery store along the way and waited while we shopped. She was very responsive throughout our trip to answer any questions we had. We had an amazing vacation and will absolutely return to St. Thomas and Sea la Vie again!! Sea la Vie was absolutely PERFECT! Family of 6 enjoyed the fully furnished beautiful, spacious stay. Waking to the waves crashing, sun shining, breezes filling the villa...Spectacular ocean views...Everything anyone could need to stay put and enjoy relaxing poolside, hot tub, courtyard..and March Madness..Just breathtaking! Go relax and enjoy! Thank you for an amazing time..and best of all...Memory...we hope to be back soon! PIctures cannot do this house justice! My family and I stayed here for a week at the beginning of August. This was our first time at Sea la Vie, but not our first time renting villas through VRBO. I must say, that without question, this was the most spectacular villa we've rented so far! As amazing as the views from the villa and the pool deck appear on the website, the views are much, much more breathtaking in person. The house was in great condition, and the setup was very comfortable for our family of 4. Chris, the property manager, was extremely helpful. But by far the most amazing thing about this villa was the pool/deck and the views from every other of the numerous decks around the house. In writing this review, I was torn...torn between my need to be honest, and my desire to keep this house a hidden secret for the next time we want to book Sea la Vie! In the end, integrity wins out, and I strongly encourage you to check this place out!